Regular readers will know that a typical dessert in our house is often nothing more than a piece of fresh fruit. That’s especially true in the summer, when we have such luscious peaches and cherries and melons in the market to enjoy. Still, once in a while, perhaps for Sunday dinner, we want something a bit more elaborate but still smacking of the warm season. Or perhaps the fruit isn’t quite as luscious as it could be. That’s where grilling comes in. Grilling intensifies the flavor of the fruit and softens its flesh, perfect for those less than luscious specimens. In fact, you should grill most fruits when they’re still firm and slightly underripe. Save those perfectly ripe specimens dripping with juice for eating raw, as they would fall apart under the grill’s heat. You can grill all sorts of fruits—pineapple, apples, melons, to name a few—but personally I think peaches are especially lovely when grilled. It’d be a delicious ending to your next backyard cookout. Grilled peaches are wonderful as is, although they’re often paired with a scoop or two of gelato. It is a match made in heaven. But for today’s post, since I happened to have some leftover ricotta in the fridge, I whipped it until smooth with confectioner’s sugar as a filling, then topped everything with crumbled nuts and honey. The result gives gelato a run for its money. Whip the ricotta cheese in a mixing bowl with a few spoonfuls of confectioner’s sugar to taste until soft and creamy. Chill for at least a half hour or until needed. Cut the peaches in half from top to bottom. Twist the peaches to separate the two halves, then gingerly remove the pit (stone) with a small paring knife. Set the peaches cut side down on a well-greased grill over a low to moderate fire (about 160-180C/325-350F if your grill has a thermometer) for about 3-5 minutes, until grill marks have formed and the peaches have slightly softened. Depending on how ripe your peaches are, you can turn them over and let them cook (over indirect heat to avoid burning the skins) for another few minutes. Transfer the grilled peaches to a serving plate and let them cool. 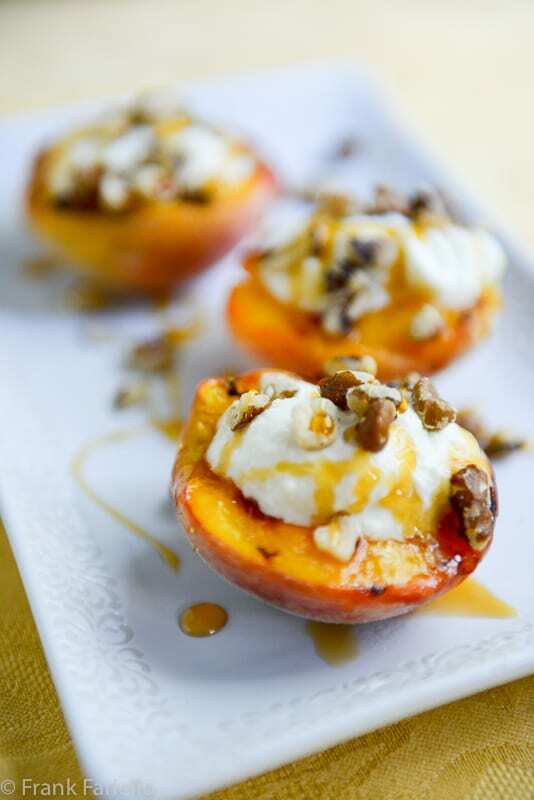 Top each half peach with a spoonful or two of the whipped ricotta. Sprinkle with the crumbled walnuts or pistachios and drizzle everything with honey. This is an easy recipe to be sure. Only one precaution, really: You need to grease the grill very well to avoid the peaches sticking to it. For extra insurance, you can also rub the cut side of the peach with vegetable oil or melted butter. If all your precautions fail and the peach do stick, use a flat metal spatula (the kind you would use for flipping hamburgers) to gingerly pry the peaches off the grill. You can grill your peaches equally over gas or charcoal. The brief grilling means that they don’t take on much, if any, smokiness, so the difference in flavor will be minimal. And if you don’t want to fire up your outdoor grill—or don’t have one— use a stove-top grill pan or a stove-top griddle. Whip the ricotta cheese in a mixing bowl with a few spoonfuls of confectioner's sugar to taste until soft and creamy. Chill for at least a half hour or until needed. Great tips Frank, thank you so much. It’s definitely a show-stopping dessert despite its simplicity. I’m book-marking for certain for when Ontario peaches are out. I may even add a surprise garnish! We had our first Ontario peaches on the weekend, JT grilled them on the charcoal grill and they were awesome. It was for a dinner party so my friend brought Madagascar vanilla bean gelato and it was awesome. Such a simple dessert but it really hit the spot. I marinated the peaches in some fig balsamic with some cognac and roasted the walnuts, a perfect summer dessert, thanks for the inspiration. I remember when I was 16 and stayed in a little hotel in Italy and dessert was a ripe peach with ricotta cream. I thought I died and gone to heaven. I can imagine it was just like that. Simplicity, always the best choice especially when paired with ricotta & honey. Summer entertaining could not be easier. hanno un aspetto molto raffinato, cerco sempre qualche facile ricetta per chiudere una cena, grazie ! Holy cow, Frank…these grilled peaches look amazing! I do love to grill, and the idea of serving dessert straight off the grill is certainly appealing. I also love peaches. It’s sometimes hard to find really good peaches here in the northeast, so I’m thinking grilling ’em up could be a great solution! I’m saving this recipe to make soon for sure! That’s great, David. The peaches around here can be iffy, too, so grilling is a good way to bring out their flavor. Looks positively wonderful, Frank. Peaches (ripe ones in summer) are my favorite fruit, and I do stuff them and grill them with amaretti cookies, but will have to try your version next. Your Pesche grigliate looks just perfect for a summer desert. I liked the simple method of making the creamed ricotta. Also, a great tip about not making the dish ahead. I’ll bet this is nothing short of delicious. I love fresh peaches. I’m so taken with the term Pesche grigliate! It sounds like a secret society that I’d want to belong to! Peach season his here in the desert and it’s going to be a good year, I can tell. Even when hard as a rock, the sweetness is like a drug. (You know how I like my sugar!) Your ricotta filling would be gelato for this any day! You guys are lucky! A sweet peach right off the tree is a wonderful thing. We had a peach tree in our yard back in Rome. I still dream about those peaches! Sadly, we’d usually lose half of them to wasps… but the ones that remained were out of this world. I love grilled fruit, pineapple in particular. Peaches are a close second or third for me — quite nice. Really like how you’ve topped these — really nice flavors. Thanks! And thanks for your comment, John! We have the most incredibly sweet peaches right now, and I can just imagine those grilled this way! I may just do that if we turn on the bbq before they’re all gone and maybe add a splash of rum!